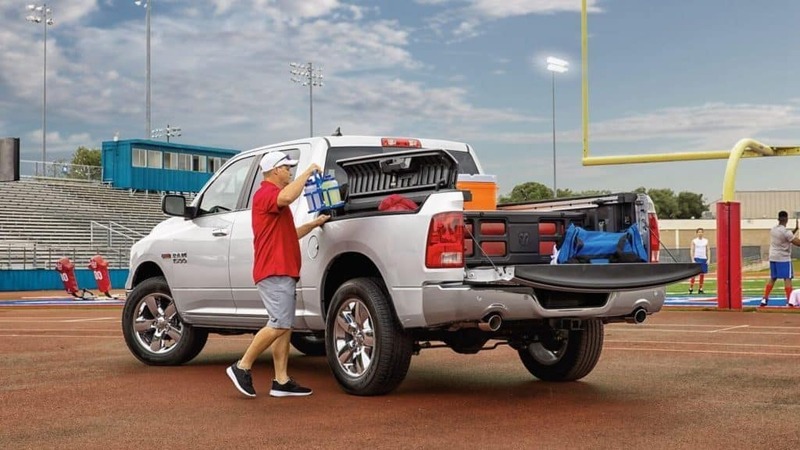 RAM has taken the unused side-rail space and turned it into an exclusive cargo management system with durable, drainable storage for tools, gear, and whatever else your job requires. Drivers can choose between the 5-foot-7-inch, 6-foot-4-inch, or 8-foot pickup bed lengths. Pick the perfect cab from options that include Regular, Crew, and Quad Cab sizes with room for as many as six adults. Drivers can equip the RAM with a central locking system that allows them to unlock the doors, tailgate, and cargo boxes with the push of a button. Cargo Management System: The RamBox cargo management delivers cargo box lighting, cargo bed extenders and dividers, and bed rails with adjustable tie-down cleats. Tonneau Covers: Secure cargo and reduce drag on the vehicle with one of the available bed covers. Bed Liners: Spray-in or drop-in bed liners help to protect the bed of the RAM and make loading and unloading easier. Side Steps: Drivers can choose single side steps or wheel-to-wheel sidesteps to make getting in and out of the truck and accessing the cargo bed simpler. Lighting: LED lighting in the cargo area allows drivers to work at night without lugging extra equipment along. Factory-Installed Trailering Equipment: The integrated trailer hitch and available four and seven-pin trailer hitch wiring harnesses help drivers to connect to towing equipment with confidence. If you’re still deciding between American pickup trucks, compare the RAM to the Ford F-150, or even the RAM 1500 Crew Cab to the Ram Quad Cab at Juneks. Once you’ve decided on your favorite RAM 1500, feel free to schedule a test drive today. Visit us in Spearfish to try it out – and just ask about our hometown pricing!